Ruby's is a discreet cocktail bar on Stoke Newington Road, Dalston. The decor is made up of white tiles, battered walls and vintage furniture. A small selection of cocktails, beers and wines are served. Do you work at Ruby's? What did you think of Ruby's? 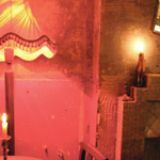 Billed as Dalston’s hot new ‘subterranean drinking den’, Ruby’s is a speakeasy-style bar located in a basement off Stoke Newington High Street, and a purveyor of both style and substance. True to its speakeasy theme, Ruby’s is only identifiable by the gaudy retro cinema-style sign above its narrow (blink and you’ll miss it) stairway entrance. This unassuming exterior only adds to the impressiveness of the space below: a basement space that's a veritable mesh of exposed brickwork, stone paving and dark wooden furnishings. Here, ‘small’ definitely equates to cosy rather than cramped, with a scattering of ornate lamps, inbuilt ceiling lights, and an open fireplace – complete with realistic electric flames – casting a warm glow. The bar itself is compact with just a couple of stools pulled up against it, and seating mainly consists of high-backed chairs set around small, circular tables. Perhaps what is most impressive is that this was once a Chinese takeaway, beautifully refurbished to the extent that several well-known music artists had used the venue for filming before its owners acquired a licence. The layout and size means the venue is more suitable for smaller groups and couples to enjoy in-depth conversation over their cocktails, rather than being a place for a large group knees-up. Also, it would seem a shame to drown out the well-chosen music – a combination of lo-fi blues and good old-fashioned rock’n’roll – with raucous banter. 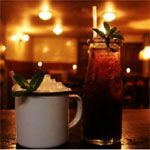 The main talking point here is the cocktails (all £8) – a succinct list of 5-6 classics (with the occasional twist) that is open to change on a monthly basis. A Blackberry Mojito (artfully served in a recycled forties-style glass milk bottle) is sublime – the fruit so ripe and zingy that some may be tempted to include it in their 5-a-day quota, despite a generous helping of rum and chambord negating any health benefits. The Hemingway Daiquiri is also a winner – a sharp, heady blend of grenadine liqueur, rum and fresh grapefruit juice. All spirits are premium, naturally, and include the much-coveted Sipsmith’s gin (£3.50 for a single measure) amongst the selection. Also available are lagers of the more discerning variety – with brands such as Brooklyn and Pacifico (£4 each) – as well as a small list of wines (from £5 a glass). Ruby’s is definitely a venue to prove the cynics wrong, possessing the genuine feel of a hidden gem, rather than a try-hard hipster concept bar. Come here for gorgeous cocktails in a unique and attractive setting.